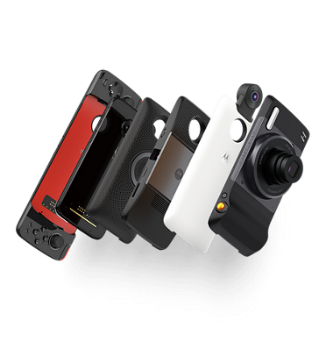 From 2006 to 2017, the company has developed more than 100 technology prototypes and transferred 105 technology platforms to over 90 technology recipients to the public and government sectors. 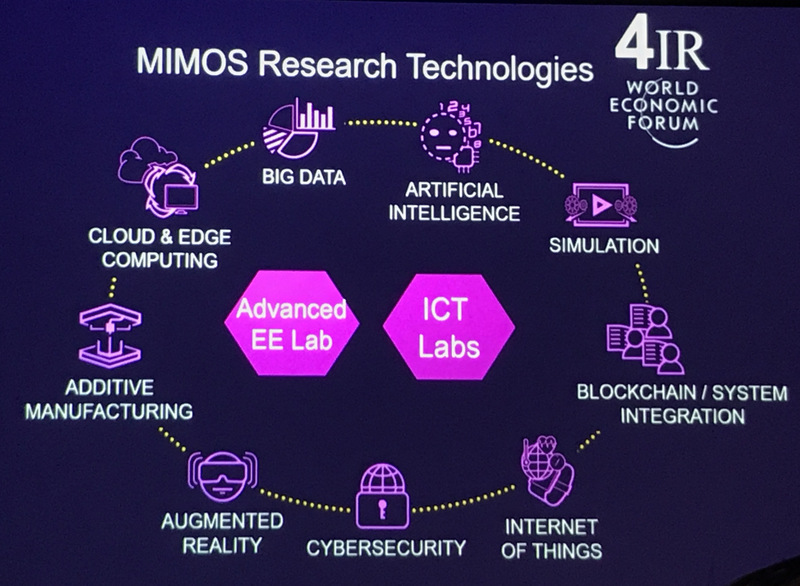 Some of the highly acclaimed projects that MIMOS are currently involved with the government sectors were shared with us throughout the visit. Some of the projects were also demonstrated to us when we dropped by the technical labs for a visit. Microelectronics System Center – provides Integrated Circuit Services, System Design (specifically for IOT, Wireless equipments), EDA & CAD tools. Advanced Analytic Services – provides failure & material analysis, semiconductor & reliability engineering. A centralized data query site which collects data from the world wide web (social media, open data portal). From the data queried online, the platform then does data processing and analytic that is able to justify any speculation or conclusions based on the analysis done on the collected data. 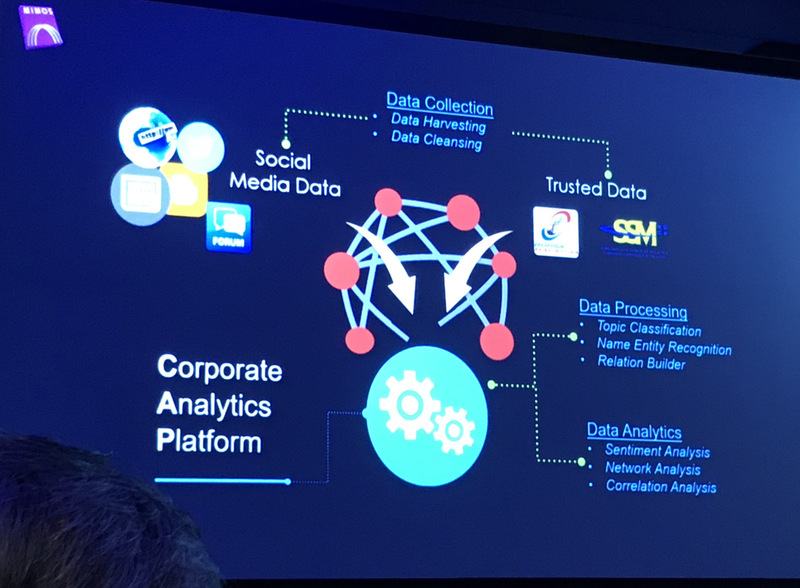 They also showed a short demo on how the platform does data cleansing to remove any irrelevant data from the collection. A centralized system to authenticate user for any given system, where the application created was able to login a user and track or monitor user’s access to a specific system. Tracking were able to be done via timing and location, for example where the user has accessed specific information and time when it was done. 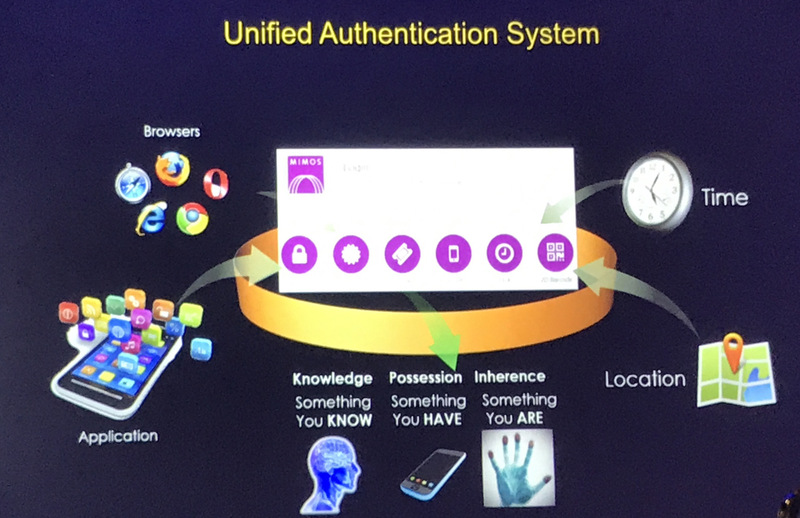 The system also uses multi-factor authentication methods, such as password, certificate, One Time Password token, Time Constraint Key, 2D Barcode, FIDO U2F (Fast Identity Online Universal 2nd Factor), Facial Recognition and Mi-VID. System to enable user to digitally sign any document without having to authenticate a person’s identity each time. An app which is downloaded on Android / iOS devices can be used to allow the digitalization of signature once a person has completed registration via a kiosk which authenticates fingerprint and Identity Card. Using open web data (data from waze), they were able to do data prediction of traffic flow and congestion in KL. They provided an example of data from one scenario where data shows the bottle neck of traffic on Jalan Tun Razak in KL during peak hours were caused by a road (Jalan Kia Peng) merging into Jalan Tun Razak. From the analysis, they were able to predict that traffic congestion could be reduced significantly by closing Jalan Kia Peng during peak hours. The presenter was honest to mention that when they executed the closure of Jalan Kia Peng during peak hours, the congestion issues at that bottleneck intersection was solved. Unfortunately the data failed to show that by closing Jalan Kia Peng, traffic congestion would take place further down Jalan Tun Razak where the next road merges into the main road. There was also an issue to track foreign workers in Malaysia who had overstayed their visa period. During their investigation on this issue, data analysis instigated that some other fraudulent activities were being carried out. The data showed that a particular officer had issued passport stamps amount which was significantly higher than the other officers and was logically unable to be done physically within a limited time frame. Further investigation from authorities proved that the particular officer had been issuing passport stamps outside the office hours. Polis Diraja Malaysia uses HR management system which tracks information such as demographics, employee vacation, training, skills and medical leave. 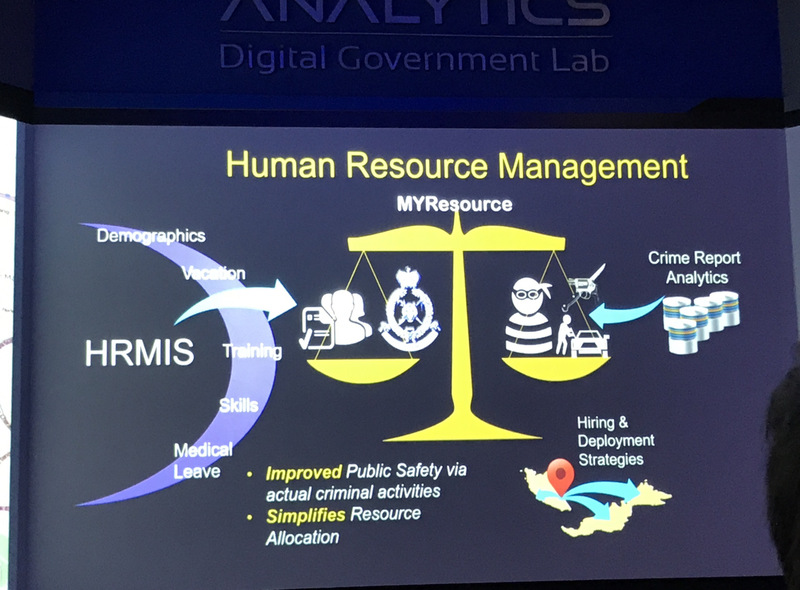 Through data analytic they were able to link the police resources and response rate with actual crime reported rate to implement improved hiring and deployment strategies. The improved strategies ensures each area with high reported crime category is appropriately allocated with specialized task force which is able to react to the type of crimes. 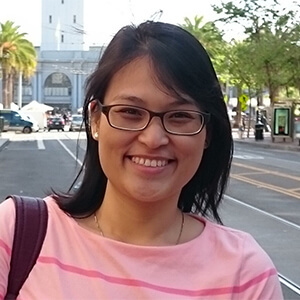 Data from hospitals are collected into the system with privacy protection for patients. The system separates the personal data of individuals and uses an identity index only known to admins. Any data pulled from the system and used by Analyst will not have direct links to patients. We were introduced to the VR / AR Lab in MIMOS where they demonstrated and explained the difference between VR and AR. Virtual Reality was defined as a computer-generated simulation of a 3D image or environment that can be interacted within a seemingly real or physical way by a person using special electronic equipment such as a headset with a screen inside or gloves fitted with sensors. Augmented Reality was defined as a technology that imposes a computer generated image on a user’s view of the real world, thus providing a composite view. 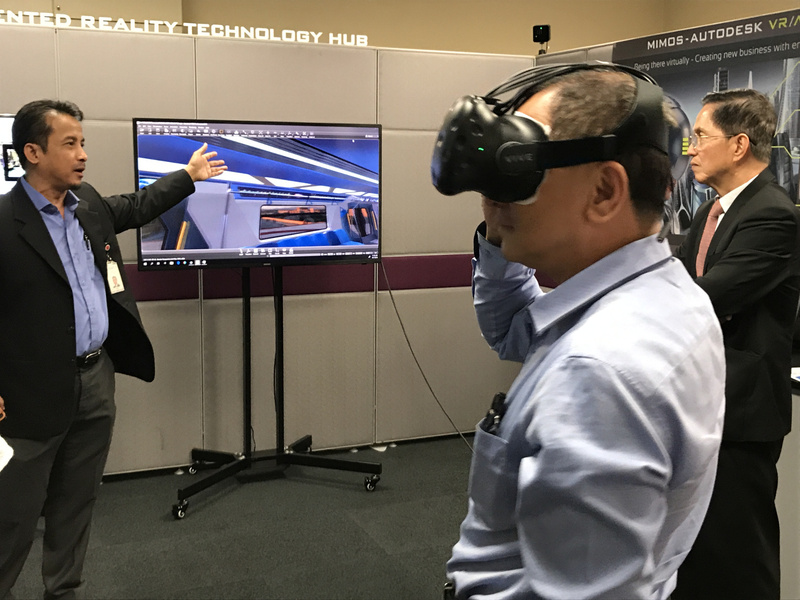 They had a demo with a headset of a VR view of the newly constructed MRT train. They explained that the VR software were designed using softwares such as AutoCAD to draw and design the reality to suit the requirements of customers. A complete centralize system that monitors and adjusts temperature, lights, ambiance to help reduce power consumption in homes and office areas. They explained that MIMOS office has already been equipped with the system and in the past has proven to reduced the cost of electricity by as much as 40%. The sensors works within a WiFi connection and will communicate with a main hub which determines light and temperature settings to monitor and control. The lights are also equipped with motion sensor to detect when to power on or off. MIMOS campus uses image recognition for security accessibility to allow vehicles to enter the campus. Image recognition is done on vehicle number plates and vehicle type / color upon entering and exiting the campus and will connect the entry and exit to user profiles registered to the vehicles in the system. Even for visitors entering the campus do not require to stop at the entrance to register themselves and their vehicles, registration can be done beforehand with submitting car registration plates and car type / color. This feature has been previously tested in Sunway Group buildings and they seem to be in discussion with MIMOS for further development work and possibly for implementations. System that tracks individual in indoor locations where GPS signals are unavailable. The system uses unique WiFi signatures to determine the exact location of a person either by using phone or custom made devices. 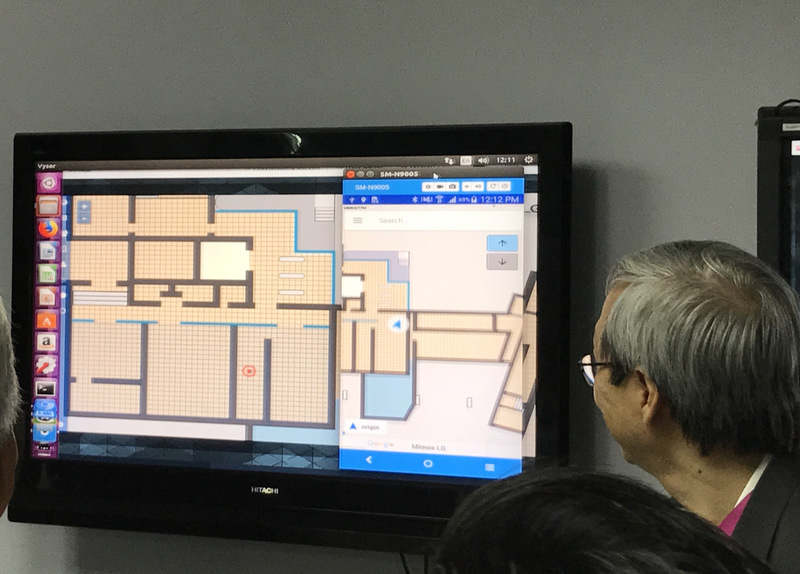 Within the app, the location of a person is able to be determine and can also be used as directional guide within the building. 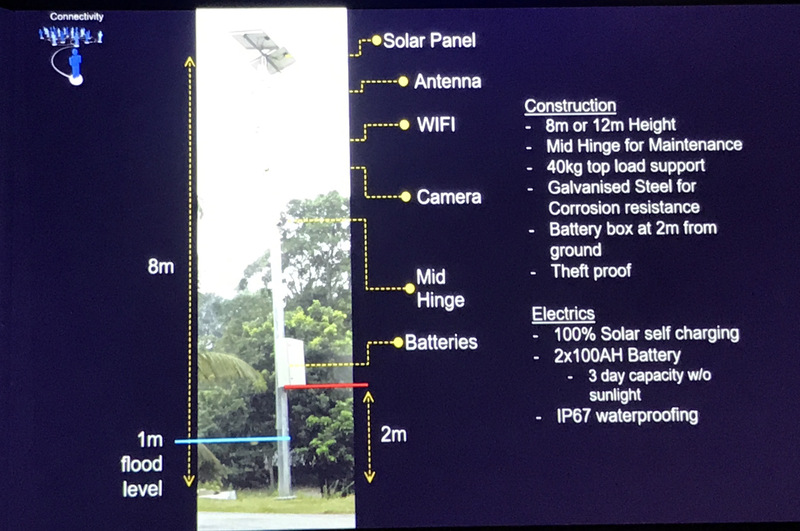 In rural areas, there were difficulties to monitor flood areas and the solution to the problem is to install WiFi connected street lamp with solar panel battery pack. With camera installed in the street lamp, they are able to identity flood areas. CCTV installed outside of schools / hospitals / mosque / church / community centers to help monitor any suspicious or potential criminal activities. In Agriculture, companies such as Royal Birds Nest have installed sensor boxes to monitor for environment conditions such as humidity and temperature to ensure the conditions are suitable as a habitat for birds. CCTV are also installed and the image detection is able to capture the rate of inflow / outflow of birds to the area. Durian Tracking Able to track where locations to which Durians are being shipped to and also monitor the customer group, this completely eliminates any middle man during the export. Customers are also able to scan QR codes on packaging to know where the Durians originates from. Monitor the crowd density at MRT stations via video surveillance and also monitors for any unattended objects. System is able to identify when objects have been left unattended and will notify when the objects have been left behind by their owners. Petronas implemented a system to ensure workers are constantly compliant to safety procedures. Safety helmets are constantly not worn in hazardous areas and cameras are installed and able to detect when workers are in the area without wearing safety helmets. Similar implementations used when workers are stepping out of the safety boundaries. Surveillance cameras has been installed in almost all prison and detention centers in KL. 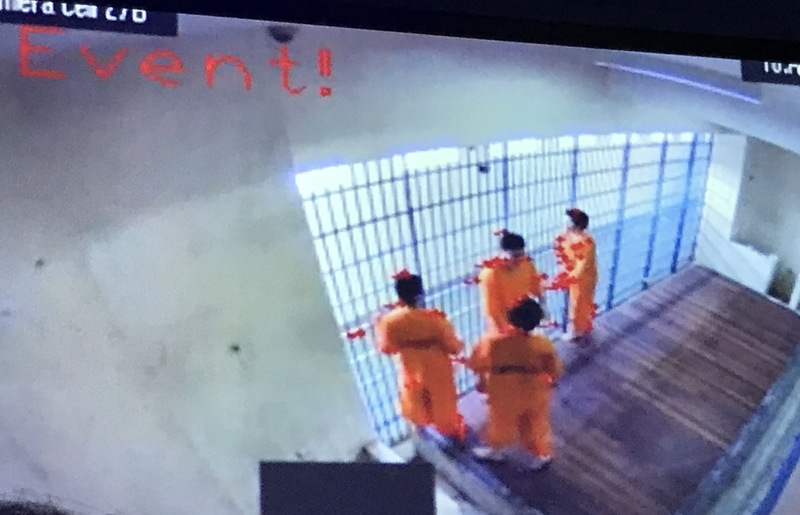 Motion detection of inmates movements are tracked to determine if any actions or behaviors would be harmful to others in the cell and to prevent for fights within prison cells. 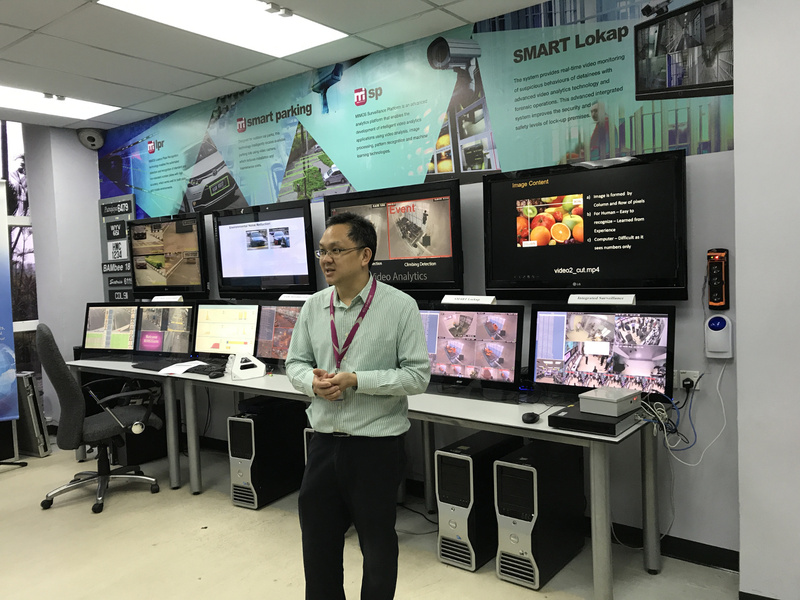 It was an insightful visit to get to learn about the latest technologies which are currently available within the country and the efforts by MIMOS to play an important role to contribute towards helping both the local public and private sectors in development growth towards the Fourth Industrial Revolution.